Habit: Annual from taproot. Leaf: basal and/or cauline, alternate, simple to 2-pinnate. Inflorescence: spike. Flower: opening at dusk; sepals 4, reflexed singly or in pairs; petals 4, generally white, pink, or rarely red, without spots or ultraviolet reflective area, fading red; longer stamens opposite sepals, anthers attached at middle, pollen grains 3-angled; stigma hemispheric, generally > anthers and cross-pollinated or +- = anthers and self-pollinated. Fruit: straight to coiled, sessile. Seed: in 1 row per chamber, obovoid to oblanceoloid, minutely pitted, sometimes those near base of fruit coarsely papillate. Species In Genus: 7 species: western North America. 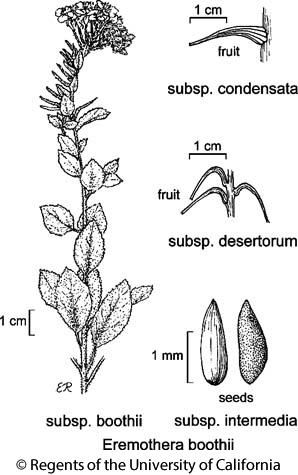 Etymology: (Greek: desert + Oenothera) Note: Incl in Camissonia in TJM (1993). Habit: Plant generally +- red; rosette generally 0 (to well-developed); hairs minutely strigose and spreading, some glandular, especially in inflorescence. Stem: erect, peeling. Leaf: lanceolate to narrowly elliptic or narrowly ovate, sparsely minutely dentate or serrate; proximal oblanceolate or 0. Inflorescence: nodding; flowers generally 0 at proximal nodes. Flower: hypanthium 4--8 mm; sepals (2.7)4--8 mm; petals 3--7.5 mm, generally white (red). Fruit: 8--35 mm, 1--3.8 mm wide, cylindric, tapered to tip, +- curved outward to strongly wavy and twisted, persistent, tardily dehiscent. Seed: 1.4--2.1 mm, generally of 2 kinds, minutely pitted in rows, pale brown and coarsely papillate, dark brown. Chromosomes: 2n=14. Habit: Hairs dense, spreading (and glandular, especially in inflorescence). Stem: 5--20 cm. Leaf: generally < 25 mm, +- narrowly lanceolate, or proximal oblanceolate, +- entire to minutely serrate. Inflorescence: bracts leaf-like; flowers sometimes present at proximal nodes. Fruit: 1--1.4 mm wide, generally curved outward or +- wavy and twisted. Ecology: Sandy soils, sagebrush scrub; Elevation: 1500--2150 m. Bioregional Distribution: SNE, DMtns; Distribution Outside California: Nevada. Flowering Time: May--Jul(Oct) Note: Intermediate between Eremothera boothii subsp. alyssoides, Eremothera boothii subsp. boothii; +- uniform. Citation for this treatment: Warren L. Wagner 2012, Eremothera boothii subsp. intermedia, in Jepson Flora Project (eds.) Jepson eFlora, http://ucjeps.berkeley.edu/eflora/eflora_display.php?tid=89265, accessed on April 24, 2019. No expert verified images found for Eremothera boothii subsp. intermedia.